These tarts can be topped with any fruit you like. Put the flour and salt into a bowl. Add the butter and rub in with your fingertips. Alternatively, blitz in a food processor. Either way, you want a mixture that resembles fine crumbs. Add the egg yolk and mix in lightly with a blunt knife or a spoon. Add just enough ice cold water to bring the mix together into a dough. Knead very lightly on a floured surface, then form into a flat disc, wrap and chill for 30 minutes. Preheat the oven to 200°C, gas mark 6. Roll out the pastry thinly and use to line either 6 x 10cm tartlet tins or 10-12 x 5cm tartlet tins. Prick the base of each pastry case with a fork. Bake for 15 minutes, or until golden. Remove and leave to cool in the tins. 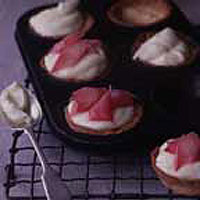 To make the rhubarb topping, put the rhubarb into a pan with the water and sugar. Cook over a very low heat for about 20 minutes, until soft. Leave to cool. For the filling, beat the cream cheese, sugar and crème fraîche together. Whip the cream until it holds soft peaks and fold in. Use to fill the tart cases, top with rhubarb (or fruit of your choice), drizzle with the maple syrup, and serve.